We’re happy to share this post from our sister site, Kids Corner @ Kindle Nation Daily, where you can find all things Kindle for kids and teens every day! Now we’re back to offer a free Kids Corner excerpt, and if you aren’t among those who have downloaded this one already, you’re in for a treat! Upon waking on the morning of her tenth birthday, Moxie Wyoming Woodson embarks on a summer of magic, mayhem and adventure. With rodeo champion Granny Rose as her inspiration, Moxie’s birthday dreams kick up visions of a fine young horse that will also help her take on the more grown-up chores on her family’s Wyoming ranch. When her father unloads from his trailer the old sway-backed grey-flecked little black horse, Misty, Moxie’s hopes lie trampled in the barnyard dust. What she cannot see, but will come to discover, is that her new horse is special in more than just the way she brings this intrepid heroine into her own. 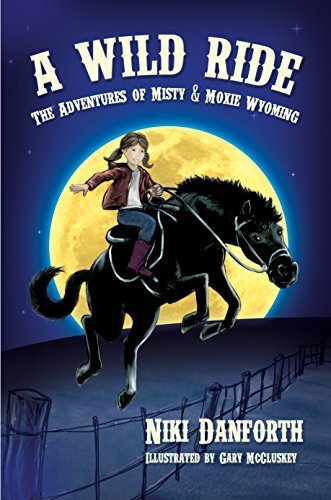 Channeling her natural instincts to care for animals and dragging along her reluctant best friend and sidekick Pickle Turner, Moxie Wyoming grows out of pouty disappointment over her broken-down mare. She transforms into a courageous sleuth, hot on the dusty and sinister trail of a menacing gang with a hard-hearted plan to round up and sell a bold and beautiful herd of wild Mustangs. Along the way, Moxie learns there is more magic in helping endangered animals than aspiring to win rodeo ribbons. Moxie Wyoming Woodson popped up in bed, her brown hair sticking out every which way. Moxie blinked at the early morning light streaming through the window. It landed on her favorite poster of a wild Mustang herd galloping through a canyon. She listened to the rooster crowing, rubbed her eyes, and jumped out of bed. Today was also the start of summer vacation, and she didn’t want to miss a second of it. In a flash, Moxie brushed her teeth, used her fingers to comb her shoulder-length hair into loose pigtails, and threw on some jeans and a tee-shirt. She heard a barking noise and rushed downstairs. Moxie plopped down at the bottom of the staircase and nuzzled the family dog, a lovable golden retriever mix from the local pound. She looked up at a large painting hanging in the front hall. It was a portrait of her great-grandmother from long, long ago, dressed head to toe in pink cowgirl clothes, sitting on a beautiful black horse. “I wonder if I’ll ever grow up to be a champion like you, Granny Rose.” Moxie sighed. “Then I could be extra-special, too, like you.” She hopped up and hurried into the kitchen with Bunker. Moxie added milk to a bowl of cereal her mother had set on the table, and gulped it down. She rehearsed a short speech for her father, reciting it to Bunker. The dog tilted his head while she practiced, as if he were listening, but she knew he was really more interested in what she was eating. Placing the bowl on the floor for Bunker to lick, Moxie dashed out the door. She saw her dad by the barn loading gear into the bed of his truck. She tiptoed over and noticed how his shaggy dark hair stuck out every which way. She loved that he looked like her when she got up in the morning, but he got to look that way all day long. I guess it’s ‘cause he’s a grown-up, she thought, and he doesn’t have a mom making him comb his hair. “Hey, Moxie Wyoming! Happy birthday!” Laughing, Mike Woodson swooped up his daughter for a good morning hug and kissed her on the cheek. His unshaven face tickled her. “Now, darlin’, I don’t have the right horse for you…at the moment,” he said, glancing at the trailer. “We’d have more daddy-daughter time,” she interrupted, and beamed her widest smile at him. Chuckling, he closed the doors of the trailer. “Later, squirt.” Waving to her, he put his foot on the gas and the truck rolled down the road. Moxie climbed aboard one of the ranch’s all-terrain vehicles and propped her dusty, brown cowboy boots on the handlebars. If her father was picking up a horse for her, wouldn’t he take her along, especially on her birthday? Later that afternoon, Moxie sat on the step by the kitchen door next to a purring gray barn cat as her father pulled up. Her chores were done. She had also gathered eggs in the chicken coop, eaten lunch, and been waiting for what seemed like forever. Now he was back. Finally. “How’d you know, kiddo?” Mike Woodson smiled at his daughter as he climbed out of the truck. “Sure, Dad. Right.” She figured he was kidding. He unlatched the back door of the horse trailer and stepped into the dark. Moxie could hear her dad moving around inside, speaking quietly to someone. With growing excitement, she walked over, carrying the cat in her arms. Expecting to see a fine-looking young horse stride down the trailer’s ramp, Moxie stopped in her tracks and dropped the cat when she finally got a look. This could not be her birthday present. It had to be a terrible mistake. Moxie watched her father lead off the trailer what she thought was the saddest excuse for a horse ever. The animal’s black coat was so gray-flecked, that he—or was it a she?—looked more gray than black, making it look old. But the horse’s most noticeable feature was the steepest swayback Moxie had ever seen. It swooped down and made the animal’s belly hang as low as low could be. “What’s up with that horse, Dad? You could skateboard down one side and up the other,” she sputtered. “Moxie Wyoming, you cool it,” he said and smiled. “This little mare is yours!” The barn cat meowed and ran off. That cat feels the way I do, Moxie thought. “Yes, you can,” he answered. “So why’d she have to come here?” Moxie pushed out her bottom lip. Moxie didn’t feel convinced, and sniffled again. Moxie noticed that the old horse looked bored and sleepy, as if she didn’t want to be there, either. Moxie shuffled over, frowning and kicking up dust with her cowboy boots. Reluctantly taking the lead rope, she stood sighing heavily before her dad as he made the introductions. She did happen to notice Misty’s one white sock on her left hind leg. “Yeah, whatever,” Moxie said, glancing at the horse’s face. She was surprised to see Misty’s brown eyes wide open and looking straight at her. Then Moxie watched something peculiar. While the horse’s left eye stayed open, her right eye closed and then snapped open again. Is she winking at me? Moxie wondered and looked at her dad. But he was busy examining Misty’s hoof that was missing a shoe. Moxie looked back and the little horse did the winking-thing again and smiled at her, showing all her teeth. This is definitely weird, Moxie thought. That night, Moxie huddled under her blanket in bed. She watched her long, lean mother cross the room in a few graceful strides to turn off the lamp. Moxie could hardly wait for the growth spurt that would put her on the road to her mom’s almost six-foot height. Jane Woodson tucked the light cotton blanket around her daughter. “Now, Moxie Wyoming, I know this birthday didn’t work out quite the way you’d hoped,” she said. “But give it time. You’ll feel better about things in a few days. You’ll see.” She kissed Moxie on the forehead and left the room. Moxie pulled an envelope out from under her pillow. She flicked on a flashlight and reread the letter from her grandfather. She may not be much to look at, and I’d have to admit she’s even kind of homely. But I promise you that Misty is one special mare. You can’t even begin to imagine how this old girl will change your life, even though she’s a senior citizen, like me. Just give her a chance and let her into your heart. Your dad and I figured you were the perfect gal to look after her because you love helping animals. Why, I remember when Bunker arrived at your house, scared to death. And now look at him. What is it you like to call Bunker? A regular love bug? And it’s all because of how you took care of him. Moxie Wyoming drifted off to sleep, thinking about all the different horses at the Darwin Ranch. In her dream, she did not see Misty, who would have probably slowed her down and gotten in the way. Instead, Moxie sat on top of a beautiful, frisky, golden-colored horse with a white mane and tail, proudly leading the herd across a meadow. Moxie Wyoming loved going to the rodeo in Laramie with Pickle Turner. The two had been like brother and sister since first grade, when Pickle’s father, Willie, came to work for Moxie’s dad at the family’s Moose Creek Ranch. Their first meeting had been memorable. Moxie had filled a glass jar with crickets, hoping to surprise the skinny kid with wild, curly, blond hair. Pickle thought Moxie just wanted him to look at the bugs, but Moxie surprised him by dumping them all over his head. Instead of yelling the way most kids would, Pickle had jumped up, laughing that the crickets tickled. Moxie couldn’t believe Pickle’s reaction. To top things off, Pickle had bravely picked up some of the insects and thrown them back into Moxie’s hair. That sealed the deal, and they became best friends forever. Now, Moxie sat in the rodeo bleachers with Pickle and his mom, Carol Turner, cheering on Pickle’s older cousin, Sue. They watched Sue Turner race her horse around barrels set up in a clover-leaf pattern. Sue rode a special cutting horse that she had trained to separate cows from a herd of cattle. More than calf roping, team roping, or bull riding, this rodeo event, barrel racing, was Moxie’s favorite. She could imagine herself chasing around those barrels in record time, winning first prize just the way her Granny Rose had done so long ago. If I just had the right horse, instead of that old Misty, she thought, I could practice to be a real champion. She squeezed her eyes shut. Maybe my wish will come true. “You’re not old enough, Moxie. You have to be a teenager,” Pickle piped up. Moxie gave him a stare that would stop a grizzly in its tracks. But Pickle got that look from Moxie at least five times a day, so he was used to it. Why do people keep telling me that? Moxie Wyoming smiled just the same. After the rodeo, the kids wandered among the different pens and corrals comparing the horses and bulls. They looked through one fence to admire an enormous black bull with deep, dark eyes. Moxie looked up in time to see a man in a highway patrol uniform shaking hands with two cowboys. So that’s Officer Clem Brown, she thought, the one who’d called her dad and told him about their broken fence. She nudged Pickle. “How are you Jenkins boys doing?” The officer smiled at the two cowboys and then spoke quietly. “Hey, what’s been happening since that roundup went bad near Rock Springs last month?” Both cowboys looked surprised and uneasy. The highway trooper went on. “Jeb, I heard you were almost arrested by some sheriff’s deputies over that way.” Moxie and Pickle’s eyes grew big as they listened in. “Don’t look so worried, guys,” Officer Brown interrupted in a low voice. “I just had a talk with your friend over there, Tony Olsen. He told me we could, uh, help each other if you’re planning more…well…” The highway patrolman also looked around, but he seemed to be searching for the right words. Moxie Wyoming jabbed her friend hard in the ribs, and Pickle almost yelped. Moxie quickly put her finger to her lips, showing Pickle he had to stay quiet. Peeking through the fence, Moxie thought Jeb and Frank Jenkins sort of looked tough. Their hats were pulled low over their faces, that were covered with scruffy whiskers. “Do you guys have enough help for the roundup?” Officer Brown asked. Moxie and Pickle couldn’t believe what they were hearing. Anxious, they glanced around carefully, not wanting to be discovered. “And we’ll pay you good money for keepin’ the nosy neighbors away,” Frank added, covering his mouth with the edge of his hand as he spoke. “Remember, don’t talk about this with anyone!” Frank reminded him. Wide-eyed over what they had just heard, Moxie and Pickle peeked through the fence right above the back of the black bull. Officer Brown and the two cowboys walked away slapping each other’s backs and laughing. “They sure didn’t want anybody else to hear them,” Moxie said. The two stood up, and Pickle shook his legs out nervously. “They were talking about a roundup. What do you think they want to round up?” he asked. “That’s close to us…” Pickle’s nervous voice cracked. “You mean they’re going to steal someone’s cows and horses?” Pickle asked. Pickle didn’t look very happy about that idea. The post Kids on Fire: An Excerpt From A Wild Ride: The Adventures of Misty & Moxie Wyoming appeared first on Kindle Fire on Kindle Nation Daily.